With Christmas around the corner, we wanted to give W.B. Garvey’s remarkable new novel the review it truly deserves especially for those of you who are looking to treat yourselves, or those important people on your holiday gift list, to a literary feast. 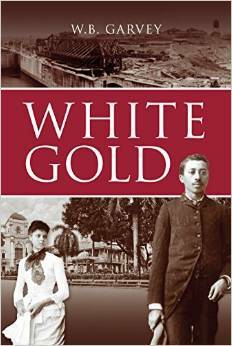 White Gold is an extremely well researched and well written historical novel highlighting the lives of William Roberson, the youthful main character, and the other unique characters from the West Indies who came to Panama to work on the Panama Canal. Actually, it’s story begins where Panama Fever: Digging Down Gold Mountain left off and it spans the years 1897 to 1912, just two years short of the inauguration of the Panama Canal in 1914. By 1897, as we’ve explained before, the Panama Railroad had already been built at the phenomenal cost of more than 25,000 human lives- mostly black West Indian lives. When I say it is a “historical novel” I mean it in its most quintessential sense as it is far from being a dull and cumbersome historical narrative. It is easy reading without betraying the expert use of our modern English language. We also thoroughly enjoyed the way the author interspersed dialogue with the English patois of our West Indian ancestors. It reads, actually, like a movie script stirring your emotions to feel exactly what each and every one of the characters of the book felt. I predict that those of you who are not history buffs already will become fans of this genre after reading White Gold. The book contains 447 pages and 45 chapters but the flow is quick and many chapters will leave you eager to continue until you’ve completed the drama. Now, for the meat or the plot of this novel that weaves together the lives of both young and old, men and women, pioneers from Jamaica and Barbados (and from other parts of the Caribbean and the world) who dared brave the rigors of Panama’s climate and hostile social environment to attempt a new life for themselves. Remember that added to the already adverse conditions created by the destruction of a peculiar Panamanian landscape, which is what the construction of the artificial waterway entailed, the Americans imported their own brand of belligerence inherent in their uniquely schizophrenic Gold and Silver Roll system which might have made for an orderly and antiseptic colonial society for the white workers and military residents of the Canal Zone, but for the Blacks especially it was a véritable enfer on earth. William Roberson, the seventeen year old son of a deceased ferry boat pilot back in Jamaica, arrives in Panama with great hopes for his future as an engineer, which is his ultimate ambition. He builds his hopes on the professional legacy of his father who perished in a horrendous ferry accident- the ferry he was piloting- while he lost his life rescuing the passengers on his boat. The male characters like William Roberson, Edward Bowers, his seasoned mentor, Hezekiah (Boy-Boy), Byron (the carpenter from Panama Fever), Martinez (a Panamanian assistant to William) and many more, are driven by their absolute faith in the rumors circulating that now that the Americans have taken over the completion of the Panama Canal, they are likely to see progress, better salaries, and more humane living conditions. Although they weren’t conscious of it when they made their decision to go to Panama, they had taken on the “Panama gamble,” which would leave many of them dead, completely frustrated, and invalid for the rest of their productive lives. Thomas Judah, whom we met in Panama Fever, who is also William’s cousin, stands out as a uniquely independent figure who broke with the pattern of most of the Black men. He eventually became a very wealthy man but in what country and under what circumstances is up to the reader to discover. The best parts of the book, in my opinion, are synthesized in the way the female characters, both new and those brought over from Panama Fever, are portrayed. Garvey does an excellent job of revealing the thoughts, feelings, frustrations and joys (which are few) of the women characters. Characters like Doña Estelle, Isabella, Grace and Winifred – William’s wife who lands an actual job as a Silver Roll school teacher- share their doggedly accurate feelings with the reader and their partners as they seem to be the reluctant voice for the men folk in their lives. White Gold is not about neat and happy endings for the black main characters. The encounters with the Canal Zone’s Jim Crow system were graphically narrated in their horrendous detail. The American Canal Zone in Panama was only a clean and orderly society on the surface because the white ruling military administrators made it so through brutal and unconscionable enforcement practices. Boy-boy’s violent and cruel encounter with a white foreman will leave you numb with outrage. White Gold is also not about hard working unskilled laborers flocking to Panama for a chance at being employed. As born out in several of the characters, many of the masons, carpenters, engineers, mechanics, and sundry craftsmen and artisans, arrived trained and highly skilled and cultured by anyone’s standards. You will get to meet these characters and enjoy following their destinies in this wonderful novel. I, for one, solved a long held mystery that many of our readers posed in their inquiries through reading its pages. “Would you help us find my grand uncle or my grand father so-and-so who left Barbados for Panama back in the construction days and was never heard from again? It’s as if the earth just swallowed him up.” I assure you that after reading White Gold many such mysteries will start to clear up. For your convenience we have included purchase information in the links below. We are especially pleased to inform you that Garvey’s books are now in e- book format through Kindle (Amazon). Click Jonkro Books to order the book (s) from W. B. Garvey’s website. You can purchase both the Kindle (E-book edition) and the paper and hardback editions. This entry was posted in American Canal, Jamaica, Panama Rail Road, Silver and Gold Roll, West Indian Panamanian Literature and tagged death-tolls-on-the-Panama-Canal, Jim-Crow-in-the-Panama-Canal-Zone, Jonkro Books, Silver and Gold Roll System, W.-B.-Garvey, White Gold. Bookmark the permalink. Pancho, I believe you will thoroughly enjoy it! Thanks for the rec. Am eager to read this.